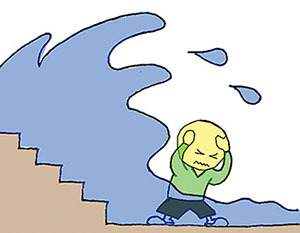 Typhoons and torrential rains can cause major damage to cliffs and other locations. If you live in housing near a cliff or that has a retaining wall, basement or semi-basement, you should conduct inspections on a regular basis and prepare countermeasures in case of a disaster. 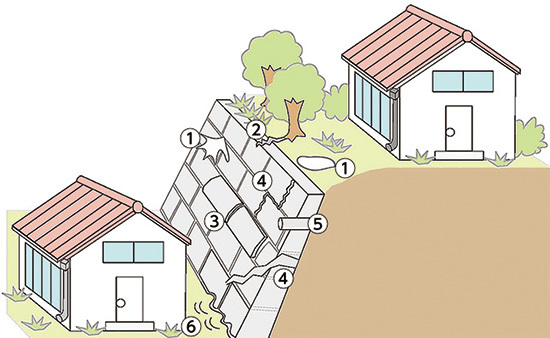 Shinjuku City offers subsidies to owners of retaining walls, etc. to cover the cost of renovation and construction. Is water leaking from the retaining wall or over the top of the retaining wall? Are the tree roots or vines affecting the structural integrity of the retaining wall? Are parts of the retaining wall bulging out? Are there cracks in the retaining wall or along the seams of block walls? Is there a drain hole (drain pipe)?